Math teacher Bernard Assing, congratulates student Aaron Mohammed, who earned a distinction in the CSEC math exam. Also in photo are Mohammed’s parents Nazir, right, and Nadia. After five months of studies, a 12-year-old boy has achieved what his seniors are struggling to—a distinction in Mathematics at the Caribbean Secondary Education Certificate (CSEC) examination level. 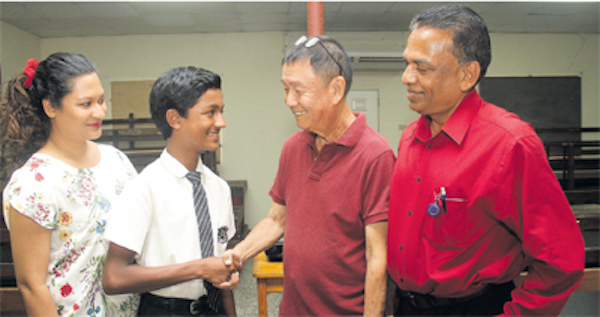 The brilliant Form One Naparima College, San Fernando student is Aaron Mohammed. Mohammed, who has brought pride to his parents Nazir and Nadia Mohammed, of Gulf View, La Romaine, as well as to his school, is the third Form One student to have written and passed maths with a distinction under the tutelage of his maths teacher Bernard Assing, who continues to teach the subject although he has retired from teaching. The trend was started in 2015 by Kiran Christian Dyaanand, another “Naps Boy” and Assing’s grandson and Frederick Thomas, an Open Bible student, who achieved the feat in 2016. Inspired by their achievements, Mohammed, who was tutored by Assing’s wife Vashti, in preparation for the Secondary Entrance Assessment (SEA) while a student at San Fernando TML, was thrilled when Assing asked him if he wanted to write the exams in January 2017. He was among the top 100 SEA students in 2016. With the consent of his parents, who never once doubted their only child’s ability to excel, Assing embarked on tutoring the young man from September last year in preparation for the January exams. None were surprised by the results which came in February. “During the Christmas holidays when people were celebrating, Aaron was doing lessons with Mr Assing at his school and also at home,” his dad said during an interview with the T&T Guardian in the classroom where he studied maths. 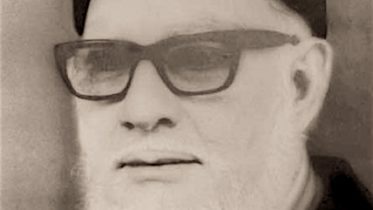 Like the others before him, Mohammed faced difficulty in registering to write the subject because of his age, although there are no rules debarring a 12-year-old from writing the exam. “Ever since I was a student at TML I was good at maths, and when I saw what Kiran and Frederick did, that was an inspiration to me,” Mohammed said of his achievement. The next step for Mohammed, who has plans to become an accountant or architect, is writing Add-Maths, for which he has already started lessons and which he will sit in two years’ time as a private student. Mohammed, an A student, who also plays the pan, football and cricket, said although he has earned a distinction, he still has a lot to learn and hopes to repeat the grade when he writes his official CSEC exams in Form Five. His parents said he remains humble and grounded in-spite of his successes to date. Be the first to comment on "12-year-old Aaron scores CSEC distinction"